We were going blind living in that small dark hotel in The Latin Quarter. Not really blind, but accustomed to night blindness any hour of the day. It didn’t much matter as every morning we dressed in black and went out. Into the light. Perhaps the only couple in Paris wearing sunglasses. Coming from Seattle, we are accustomed to that. Back to Paris: if I were transported there in my sleep, I would wake knowing where in the world I was. I was aware of that every minute of every day. The word for tourist, translated from Greek, is “the lucky invited.” Note to self: remember that, always, when traveling. Our city treks took us primarily to cathedrals and museums, and it didn’t take long to find our preferences in both. 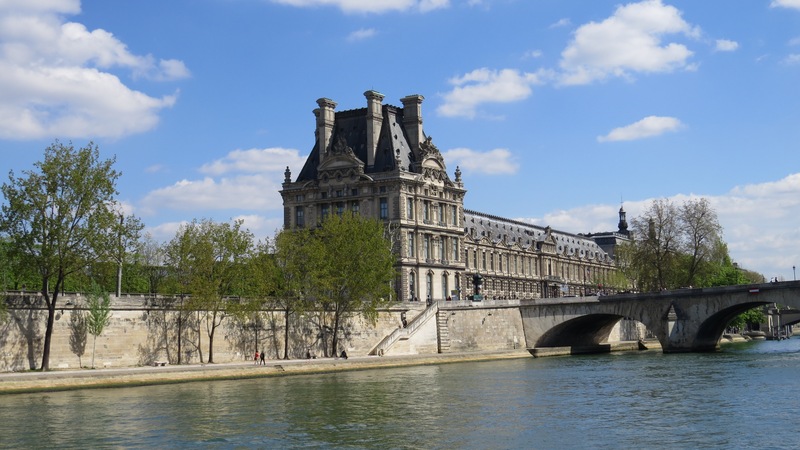 Notre Dame is gothic and dark, and the Musee du Louvre, vast and heavy. Following the arc of the history of art, we were drawn to the light. Impressionism, Pierre Bonnard, Edouard Vuillard, and Claude Monet. Monet’s immense water lily canvases had moved from the Jeu de Paume over to L’Orangerie since I last visited Paris. Surrounding an oval room with a circular sofa placed in the center, the series was meditative then and meditative now. Nothing in life has changed before these paintings. In the city I considered neighborhoods built around squares as the most desirable places in which to live. Looking up at their tall graceful windows, I imagined their views of parks and people and green. Living in a painting, what could be lovelier than that? Then boating on the Seine, riverfront residences replaced all of that for me. Old cities such as Paris were designed to be approached from the water. Suddenly I wanted to go down the river and see all of Europe this way, traveling in all that light.